23-year-old Catherine is mainly interested in Facebook and flirting, but she reluctantly takes a job at a local care home after her mother puts her foot down - and soon discovers that her new workplace contains many secrets. One of the residents at the home, 82-year-old Rose, is convinced that something sinister is going on in Room 7 and that her own life is under threat. But Rose has dementia - so what does she actually know, and who would believe her anyway? As Catherine starts investigating Rose's allegations, terrible revelations surface about everyone involved. Can Catherine find out what's really going on? We have two main characters, Catherine who is 23, self obsessed and all about her Facebook status and what she can get out of life. Rose is 82, successful author of children's books, lives at Dear Green Care Home and has dementia. She flits between present day and being cognitively aware to reverting to her 10 year old self and reliving an event over and over. Catherine gets a job in the care home, at the push of her mother and undertakes a journey of self discovery and personal growth. She forms a relationship with Rose and becomes endeared to the elderly lady, however as Rose becomes more adamant, in her lucid moments, that something is going on Catherine's interest is piqued. As she starts to nose around she finds some clues that maybe Rose is onto something with room 7 and her curiosity may lead her to more trouble and danger than she could have imagined. I do like Fitzgerald, you never truly know what your going to get when you pick up one of her books as, I feel, they are very different. This one, we know from early on Catherine is ageist, not a particularly nice individual and does some questionable things. However, Rose is quirky and fabulous and I think she gets under Catherine's skin which starts the journey Catherine goes on. There is a lot more to this story and it is hard to go into without spoilers which I never do and generally hate. Needless to say, there are twists and turns that I didn't see coming, whilst some of the book gets really dark and some readers may find uncomfortable, there is some humour within it and I can't state enough how much I liked Rose. The book also has some sexual content, abuse is also a factor although it is not throughout and when it does appear I found it was relevant to the story rather than just put in for effect. The book I could have read in one sitting however, life did not permit it so I had to steal moments when I could. 4/5 for me this time, I have read Fitzgerald before and absolutely will again, if you like a book that has some tough content, humour and grips you then this book is for you. the Exit is newly released and as good a place as any to start with this author if you haven't read her before. Fourteen-year-old Tory Brennan is as fascinated by bones and dead bodies as her famous aunt, acclaimed forensic anthropologist, Tempe Brennan. However living on a secluded island off Charleston in South Carolina there is not much opportunity to put her knowledge to the test. Until her and her ragbag group of technophile friends stumble across a shallow grave containing the remains of a girl who has been missing for over thirty years. The question is, did whoever was responsible for the girl's death have anything to do with the sick puppy they rescued from a secret laboratory on the same island? With the cold-case murder suddenly hot, Tory realises that they are involved in something fatally dangerous. But events take a turn for the bizarre when they escape some would-be attackers by using physical powers more akin to a dog than a human... Could the puppy hold the key not only to the murder, but also the strange changes that are taking place in their bodies? I have read Kathy Reichs before and quite enjoyed her writing, on the tales of Temperance (Tempe) Brennan although this is the first book in a new series. Told through fourteen year old Tory Brennan, the niece of Tempe, Tempe is refered to in this book although she does not appear. Tory lives on a secluded island with her father, their relationship is strained and new to both of them. Tory is an outcast with most of the other kids, she has a close group of technophile friends, kids into their technology and generally smarter than most of the kids on the island. When they discover a body buried in a shallow grave and a break in to a near by secured facility they find themselves the target of someone who will kill to keep the past in the past. The book, for me, started off ok. We have some cute wolve-dog family living on the island, a father and daughter trying to adjust to their fairly new and thrown upon them relationship and some mean old professor who dislikes the kids. The kids are really smart, curious and end up breaking into a restricted facility and coming upon secret testing in a lab. The fall out of this is the children find themselves changing and having new "powers", they also discover a few secrets that people have killed to keep quiet. The kids then go on exploring and digging into the past as well as trying to keep their "find" a secret as well as dealing with teen angst stuff. There was a bit too much of everything flung into this story for me and some of the things that happened and the kids pulled off, you would need to suspend reality in order to get through it. A character does a complete 1-80 with no real reason given as to why, which always annoys me. I loved the parts about the wolve-dog animals, I thought that was a nice touch, however most of the other stuff was just too far fetched for me. Considering horror is my favourite genre, I don't mind suspending belief for stories but the way this one is done, it just didn't work, for me personally. This is the start of a new series I believe and if I came across it I would read the second book but I wouldn't go out of my way to get it and I definitely wouldn't be buying it. 2/5 for me this time, I think I will stick to the Tempe books as I remember enjoying them a lot more than this one. You can find my thoughts on it on the previous entry. 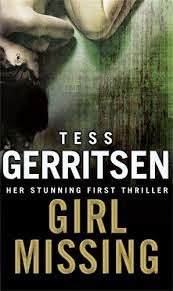 This is the first book where Gerritsen was branching into crime from romance so has elements of both in it. The book is in great condition, the spine in intact and apart from one crease to the front cover it is practically perfect. As always, the competition will run to the end of the month, the more options you do on the rafflecopter the more entries into the draw you will have. This is open to the United Kingdom only. Thanks for stopping by and good luck if your entering the comp.